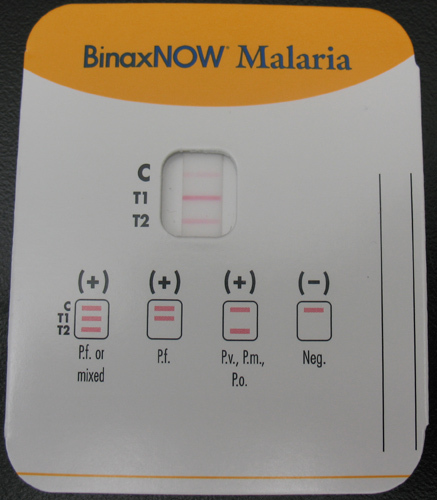 BinaxNOW® Malaria Test, the only available RDT for malaria in the United States. Rapid diagnostic tests for malaria have been developed that employ immunochromatographic methods based on the detection of malarial antigens present in peripheral blood. Most tests use monoclonal antibodies and detect particular malarial antigens in blood specimens. Tests have been developed that detect antigens including the histidine-rich protein II (HRP-II), aldolase, and parasite lactate dehydrogenase (pLDH). These tests generate results within 15 minutes and do not require skilled microscopists. Commercially available kits for HRP-II detect P. falciparum HRP-II only and therefore diagnose only P. falciparum malaria. The HRP-II antigen is synthesized and released by trophozoite and immature gametocyte stages and persists in peripheral blood. Therefore, HRP-II tests can remain positive for up to 2 weeks following chemotherapy and parasite clearance, as confirmed by microscopy. These tests have low sensitivities for detecting infections with low level parasitemias (<100 parasites/µl) and mature gametocytes. In contrast, trained microscopists can diagnose infections with parasitemias as low as 5-10 parasites/µl. The reported specificities of these tests are high (>90%). Early tests reported false positives due to cross-reactions with rheumatoid factor, but these issues have reportedly been addressed and corrected. Parasite lactate dehydrogenase (pLDH) is produced by asexual and sexual stages (gametocytes) of malaria parasites. Test kits that are currently available detect pLDH from all four species of Plasmodium. They can distinguish P. falciparum from the non-falciparum species, but cannot distinguish between P. malariae, P. ovale, and P. vivax. Tests that detect pLDH do not generate persistent positive results following chemotherapy, like the HRP-II test. Currently, the only available RDT for malaria in the United States is the BinaxNOW® Malaria Test. The Binax assay contains both the HRP II (for P. falciparum) and aldolase which is a pan-malarial antigen. It cannot separate non-falciparum species. The Binax assay should always be accompanied by thick and thin film microscopy. For more information on rapid diagnostic tests for malaria, visit the WHO siteExternal .